Cidney Fisk, the former 4.0 GPA Delta High School student who risked everything in 2016 to publicly expose the pervasive Christian proselytizing and other injustices going on in Delta County’s public schools, has completed her first year at University of Denver and will soon start her second year. Cidney paid dearly for speaking out about her public school district. She lost grants for college tuition from local funders after the Daily Sentinel published a front page article about the proselytizing which bore her photo and contained extensive quotes about what she had experienced at school. Cidney’s teachers and counselors suddenly turned their backs on her and refused to write letters of support for her applications for scholarships, effectively tanking her chances of getting those scholarships. After speaking out, Cidney struggled to cobble together enough money to attend university. Cidney is from a low income family and completely dependent on grants, loans and scholarships to fund her tuition. Western Colorado Atheists and Freethinkers (WCAF), the Grand Junction-based nonprofit whose mission includes watchdogging separation of church and state issues in western Colorado, established a scholarship fund for Cidney to try and help her raise money for school. The group ultimately raised over $5,000 to help pay her tuition for her first year at DU. Cidney has not forgotten all the people in the U.S. and foreign countries around the world who donated towards funding her tuition for her first year at DU. “My first year at DU has been an amazing experience. I have been able to fully escape the barriers made by closed-minded individuals on the western slope. I am open about my atheism and have been able to have many wonderful conversations about belief and theology with open-minded individuals and professors. I have escaped the constant torment of my peers and teachers and I am working on healing from the emotional damage I had undergone while living in Delta. 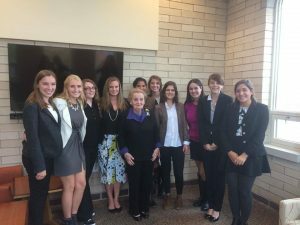 Cidney Fisk was among a small group of DU students who were privileged to meet and converse at length with former U.S. Secretary of State Madelyn Albright on October 12, 2016. Since I’ve been living in Denver, so many excellent opportunities have presented themselves to me. 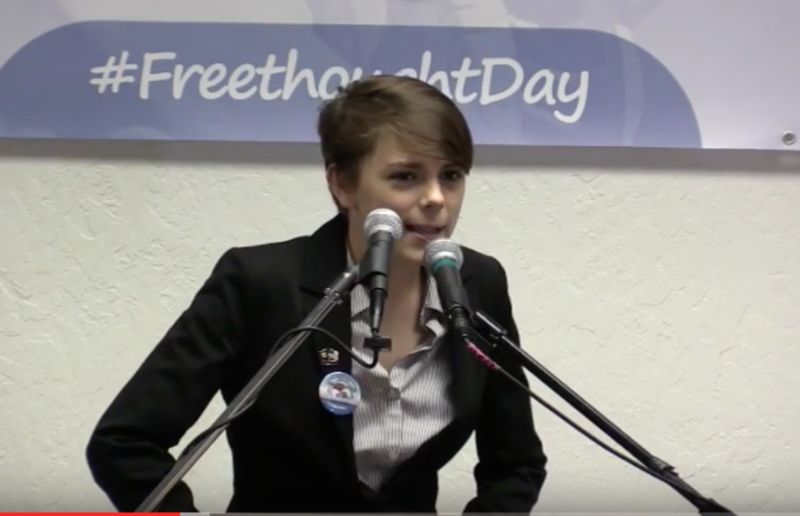 In October I was flown out to Sacramento to speak at California Free Thought Day, where I shared my story and was able to make several meaningful connections. That same month I was also hired as a fellow for Hillary Clinton’s campaign on The University of Denver’s campus. As a fellow as I was able to meet personally with former Secretary of State Madeleine Albright. I also had the pleasure of meeting Senator Bernie Sanders at an event in Boulder, and met Planned Parenthood president Cecile Richards. As the quarter went on, the election came to an end and I became involved in local politics here in Denver. I happily became a member of the Denver Young Democrats. In the spring I was invited to share my story at Denver’s Secular Hub. I was greeted by a wonderful group of freethinkers, and I felt like I fit in somewhere. Currently I am working as an intern at the Colorado State Capitol. I work for Representative Millie Hamner, who represents part of Delta County. I’m able to stay involved in issues concerning Delta County’s citizens without having to be subject to the county’s constant criticism of my beliefs and actions. I’m hoping to stick with this job as congress rejoins for session in the winter. Aside from my political life, I have been enjoying DU and Denver. I am a member of DU’s debate team. Through this program, I have been able to travel to debate tournaments in Colorado Springs, Sand Diego, and Tacoma. At two of these tournaments my partners and I were recognized as the top novice team. While in Denver I’ve attended concerts at The Filmore and at Cervantes Otherside. I’ve been enjoying the Botanical Gardens, the Zoo, Elitches, and downtown Denver. I’ve held jobs at Cherry Creek Mall and at a local popsicle shop that was once featured on The Food Network. Unfortunately, however, due to Delta High School’s refusal to help me advance my education, I still have hefty tuition bills each quarter. I typically pay around $2,500 a quarter which adds up to $7,500 a year. This is with my federal Perkins Loan which provides me with $3,000 each year. I am very grateful for this, considering my cost of attendance is upwards of $60,000 each year. I want to continue my education at this wonderful institution, but my financial situation may limit my ability to do so. I do want to thank everyone who has given me assistance, whether it was financial or emotional. I couldn’t have gotten this far without you all. Want to help Cidney fund her second year of university? Use the link on Western Colorado Atheists and Freethinkers Donate page. You can donate using a credit card. You do not need a PayPal account to donate using this link to WCAF’s PayPal account. When you make your donation, specify that you want your funds to go towards the Cidney Fisk Scholarship Fund. Let’s see if we can help Cidney stay in school and get through university without incurring a mountain of debt. Ann…she does not mention applying for a Pell grant. She should do that immediately if she has not. Her other alternative is going to a community college in Denver for her second year. Year 3 and 4 are the only years that really matter. She just needs to make sure the credits from a CC are transferable toe the university of her choice. One year in CC would help her recoup some financial grounding and still maintain her network. Too many youngsters think they have to start and end at a uni when a community college for the first 2 years is so much more practical. Benita,I’m sure you mean well,but Cidney has clearly established meaningful and precious relationships with prestigious groups and individuals through her work and life as a Freshman at Denver University.To suggest that she break those connections is ,in my view,clearly counterproductive,to the contrary,she needs to pursue the social,political,educational track that she, her family,and friends and concerned citizens groups have worked hard to develop and fund.Your larger point regarding the value of Community College and practical education planning is well taken,but,I want to tell you that Cidney is a very special young lady and we should do whatever we can to support HER well thought choices for her future,thanks.